Kate Burke, like her opponent, says northeast Spokane residents are worried about property crime. But she argues the city needs to target the root of the problem. Make no mistake: Tim Benn is a conservative. In 2012 and 2014, he ran as a Republican for state representative. 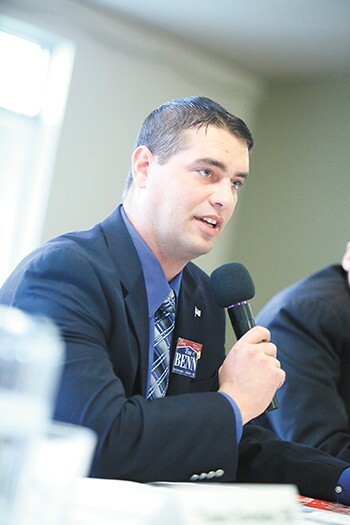 He regularly mocks liberals on a radio show with Mike Fagan, the sole conservative on the Spokane City Council. And make no mistake: Kate Burke is a liberal. Since 2014, she's been the legislative aide for Democratic State Sen. Andy Billig and agrees with him on nearly every issue. Her nearly $50,000 in campaign contributions — almost twice what Benn has raised — is filled with donations from unions and other liberal groups. The race may represent conservatives' best chance at chipping away at the liberals' 6-1 council majority. There's no incumbent in the race, and Benn is running in the district that Fagan won handily in 2015. Tim Benn may represent the best chance for conservatives to chip away at the liberal majority on the city council. Yet neither candidate has sought to fight on traditional partisan turf. Both downplay their political affiliations. Instead, Benn and Burke converge on the complaints they've heard from thousands of local residents. They both say that District 1 residents feel like they haven't truly been heard by city officials. "It seems like in the political world, the issues are a little different than the issues in the real world," Benn says. "It seems like their biggest concern is property crime and fixing the streets properly." Burke says she hears those concerns, too. She talks about how high foreclosures and property crime levels are in the northeast region of the city. "We're workin' families," Burke says. "Those roads being terrible in this area really hurt the quality of our lives." But even if the two candidates identify the same issues as critical, their ideologies set them on distinctly different paths. Burke, for example, strongly supports requiring businesses to offer employees sick leave. But Benn argues that the city overstepped its role last year with its sick-leave mandate. "I don't think it's the city's job to do a lot of labor-related enforcement," Benn says. Where Burke wants to seek federal and state funding instead of raising taxes, Benn is more likely to talk about saving by identifying wasted money and wasted ventures. He asks questions like: Did the city have to lend Ridpath developer Ron Wells $1.75 million in loans and tax breaks to turn the hotel into apartments, or could it have spread that money out? Did the city have to shell out money for roundabouts and pretty flowerpots when there are still potholes to fix? Are we focusing too much on temporary pothole fixes instead of paving roads the right way? He passes along citizen complaints about the recent lane reduction on Crestline Street, from four lanes to three lanes, and suggests that citizens should have had a chance to vote on it. By contrast, Burke doesn't see a problem with the Crestline lane reduction. She's more concerned about the fact that after East Sprague was rehabbed, bike lanes weren't added. "I've heard a lot of talk from the community that they're not implementing bike lanes," Burke says. "That community deserves a way to safely get to work." When Burke looks at high property crime levels, she says the city needs to go deeper in addressing root causes. "We're all freaking out about getting more police officers. I agree, we need more officers!" Burke says. "[But] is that the real problem? Let's go upstream. Let's invest in mental health services and drug addiction issues." Benn believes we need to look at ways to make the police force more efficient — send college students to investigate property crimes, perhaps — before raising taxes to hire more officers. Benn was born and raised in northeast Spokane, he notes. Burke grew up on the South Hill, only moving to the Hillyard neighborhood two years ago. 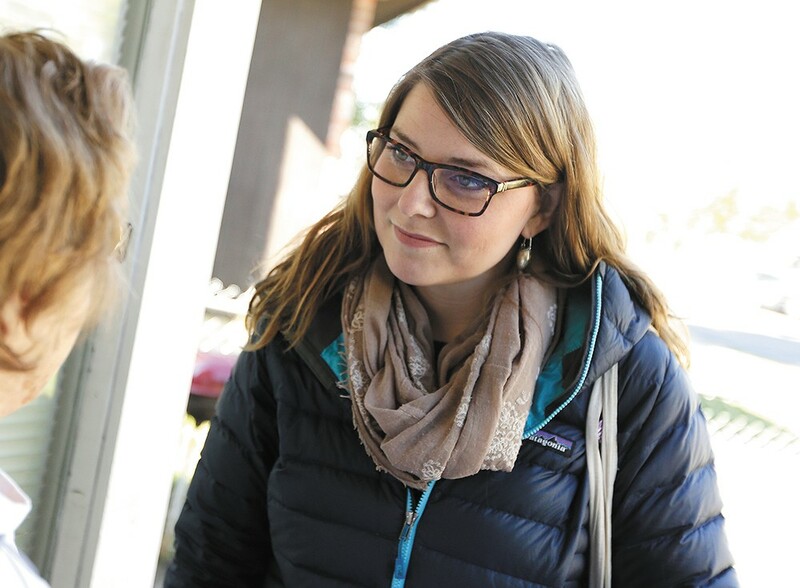 "If she were to get on the council, the South Hill would basically have four representatives," Benn says, noting that City Council President Ben Stuckart also lives on the South Hill. But Burke argues that the fact that she's lived in every district in the city — and in the Midwest and on the East Coast — gives her wide-ranging experience. She's seen what Spokane could be.